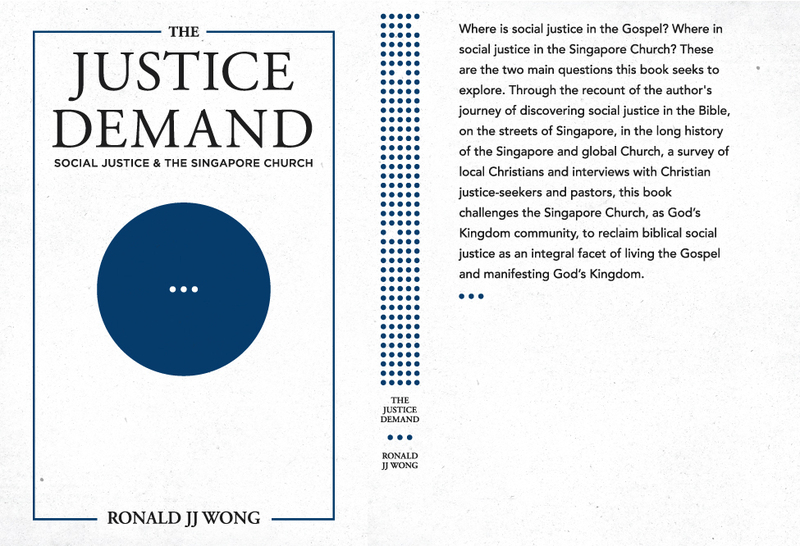 THE JUSTICE DEMAND: SOCIAL JUSTICE & THE SINGAPORE CHURCH (Genesis, 2016). Purchase a copy from Armour Publishing website. What is this book? Who is it for? When I first became a Christian, I was taught that the Gospel was about the forgiveness of my sins. And we were supposed to evangelise by sharing that information with others. Later, I came to learn that the Gospel is about the Kingdom of God. Then when I started law school, I wanted to understand what God means by “justice”. I thought this would help me score straight “A”s in school. I did not. Instead, I discovered biblical social justice. Around that time, I started walking the streets of Geylang. I was visiting brothels. Not as a customer but with a church ministry which reached out to the multi-ethnic prostitutes in Geylang. I heard stories of human trafficking. I was burdened to respond with what I could. Through all this, I came to learn that social justice was an integral part of the Gospel of Jesus, the Gospel of God’s Kingdom. But I was puzzled. Why weren’t Christians talking about this at all? Why have I never heard it preached over the pulpits? What was the Singapore Church doing about social justice? Where was the Singapore Church in all this? And where was all this in the Singapore Church? 1. 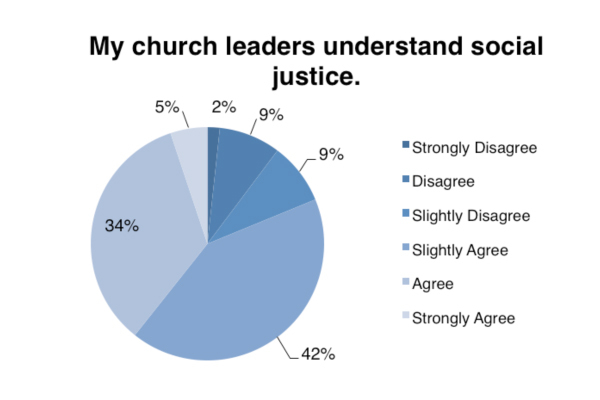 19% of the respondents do not think that their church leaders understand social justice. 2. 45% of the respondents think that their church is not doing enough regarding social justice. 3. 56% of respondents think that the majority of their church congregation do not understand social justice. Click here to check out the pie charts setting out statistics of the relevant findings. I talked to people about it. I met people who were struggling with the same issue. I met people who were doing good works in justice and mercy ministries. And they too continued to grapple with those issues. I met many people who were seeking answers on this issue. I met people who did not have the language to articulate what it was they intuitively felt about this issue. I met people who wished their churches and fellow church members would feel or think or do something about this issue. Then there are church leaders who have no idea what to do with these people. And then there are some Christian individuals who have absolutely no clue what all the aforementioned people are talking about. If you fall into any of the aforesaid categories, this book is for you. Through the recount of my journey of discovering social justice in the Bible, on the streets of Singapore, in the long history of the Singapore and global Church, and the experiences of Christian justice-seekers and pastors, I discover social justice in the Bible and in the Singapore Church. It is from a conviction and burden that I have to address this blind spot in the Church that I decided to take up the challenging task of writing this book. The book challenges the Singapore Church, as God’s Kingdom community, to reclaim biblical social justice as an integral facet of living the Gospel and manifesting God’s Kingdom. What is God’s view of justice? What’s social justice got to do with God’s story? Where in the Gospel of Jesus, the Gospel of God’s Kingdom, is social justice? What does the Bible have to say about social justice? How did social justice evolve through the Bible? What is justice, mercy and righteousness in the Bible? Where in the Singapore Church is social justice? Where are the justice and mercy ministers in Singapore? Is biblical social justice supposed to be only expressed within the Church community? What has the Great Commission got to do with social justice? What is the relationship between social justice and evangelism? Should Singapore local churches start / run social justice ministries? Or should only individuals do so? How should local churches disciple members on social justice? What’s distinctive about the Christian view of justice? What are the principles of biblical social justice? How does biblical social justice compare with secular theories of social justice? Should our ideas of social justice be brought into society? Does biblical social justice have anything to offer in the public sphere? Is social justice just a new fad? How have the Singapore Church and the universal Church expressed social justice historically and today? What are the social justice issues in Singapore today? What Christian or faith-based ministries or organisations are addressing these social justice issues today? What do Singaporean Christians think about social justice? Are local churches doing enough about social justice? What can local churches, church leaders and Singaporean Christians do in the light of these issues? The table of contents and a sample chapter of the book can be viewed below or downloaded here. N.B. Profits from book sales will go towards supporting justice and mercy ministries.